Mark Hanssen’s New Book “The Dreaming World -1.6180339887” is a Refreshing Take on Time Travel as a Means for Presenting a Collection of Short Stories with One Purpose. 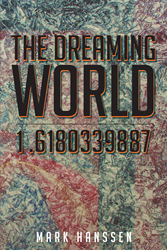 Recent release “The Dreaming World -1.6180339887” from Page Publishing author Mark Hanssen is startling and unique depiction of time travel through the actual consciousness of human hosts in different points in time. The varied “destinations” present themselves as a set of short stories that seem disjointed but serve a higher calling. Mark Hanssen, an artist and writer who is passionate about his faith, has completed his new book “The Dreaming World -1.6180339887”: ground-breaking set of stories that share two things in common, which are the presence of a “traveler” and the purpose of bringing the reader closer to the Christian God. Published by New York City-based Page Publishing, Mark Hanssen’s unpredictable tale portrays time travel as an intrusive experience in which a “traveler” would enter his or her host and essentially just ride along as the person goes about their life. In this way, the typical “paradoxes” that exist in traditional time travel stories are not an issue. Instead, the device is used to create a collection of short stories about people who are seemingly unrelated, in spite of the “traveler” which exists within each of them, that prove repeatedly the necessity of having a relationship with the Christian God. While the concept of potentially being inhabited by a foreign being which is watching everything is mind-blowing to the point of terrifying, the revelation of the life that can be had when living spiritually melts those qualms and replaces them with a strong desire to find and keep faith. Readers who wish to experience this engaging work can purchase “The Dreaming World -1.6180339887” at bookstores everywhere, or online at the Apple iTunes store, Amazon, Google Play or Barnes and Noble.